Tecumseh was born in a small Indian village in Ohio. He was a member of the Shawnee tribe. When he was still young his father was killed in a battle with the white man over the land of the Ohio Valley. Not long after that his mother left when the Shawnee tribe split up. He was raised by his older sister. Tecumseh became known as a brave warrior. He fought in many raids against the encroaching white man. He soon became chief of the Shawnee tribe. Tecumseh's brother, Tenskwatawa, was a religious man. He had all sorts of visions and became known as the Prophet. Tecumseh and his brother established a town called Prophetstown. The two brothers urged their fellow Indians to reject the way of the white man. They tried to preserve their culture and prevent tribes from giving up land to the United States. Tecumseh wanted to unite the Indian tribes into a single confederacy. He was a gifted speaker and he began to go to other tribes to convince them that the only way to fight the United States was to unite and create their own country. In 1810, Tecumseh met with the governor of the Indiana territory, William Henry Harrison at the Council of Vincennes. He arrived with a contingent of warriors and demanded that the land be returned to the Indians. He claimed that the chiefs who had sold the land to the United States had no right to do so, saying they might as well have sold the "air and the clouds." The council nearly ended in violence, but cooler heads prevailed. However, Harrison insisted that the land was the property of the United States and Tecumseh left with little accomplished. Tecumseh continued to work on building his confederation. He traveled throughout the land meeting with tribes and leaders. He went to Michigan, Wisconsin, Indiana, Missouri, Georgia, and even as far south as Florida. He was a great speaker and his emotional speeches had a great impact on the Indian peoples. William Henry Harrison became worried about the alliance that Tecumseh was building. While Tecumseh was traveling, Harrison moved an army toward Prophetstown. They met the Shawnee warriors at the Tippecanoe River on November 7, 1811. Harrison's army defeated the Shawnee and burned down the city of Prophetstown. When the United States declared war on Great Britain on June 18, 1812, Tecumseh saw a golden opportunity. He hoped by allying with the British, the Native Americans could gain their own country. Warriors from throughout the Indian tribes joined his army. He had several initial successes during the War of 1812 including capturing Detroit. In 1813, Tecumseh and his warriors were covering the British in their retreat to Canada. They came under attack from an army led by William Henry Harrison. 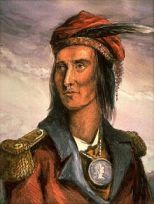 Tecumseh was killed at the Battle of the Thames on October 5, 1813. William Henry Harrison would later become president of the United States. Part of his campaign slogan ("Tippecanoe and Tyler too") used his nickname Tippecanoe which he got after winning the battle. Colonel Richard Johnson took credit for killing Tecumseh. He became a national hero and later was elected vice-president of the United States. All of his allies in the Confederacy lost their land and were forced to move to reservations within 20 years of his death. He often disagreed with the military tactics of the British commander General Henry Proctor during the War of 1812.